A hospital organization with multiple locations and departments is a dynamic organization, which has to deal with a large number of internal and external factors. For the purpose of providing good quality and an effective and efficient patient care, tailored to the actual needs of patients, the focus must be on continuous quality improvement. Therefore, a smart and transparent quality management system for employees and stakeholders is necessary, which is widely accepted in the organization. To realize structure, coherence and easy accessibility of information about ambitions, results, developments and regulations, the Northwest Clinics (The Netherlands) implemented an integrated quality management system, called Northwest: How we Work, including The House with Achievement books and the Improve 2.0 App. The House with Achievement books is an instrument for employees, staff and managers to document all agreements that are essential for optimal patient care and management. The House demonstrates what you do and the Achievement books how you do in your department. In addition, the Improve 2.0 App with a digital tracking system to register points for improvement has been implemented to achieve structure, transparency and coherence in the multiple lists with action points. Employees participate in quality groups to understand the necessity and usefulness of an integrated quality management system, to realize acceptance and to contribute to an environment of continuous improvement. It is concluded that an integrated quality management system meets the criteria of the Plan-Do-Check-Act cycle and a LEAN approach for continuous improvement of quality in patient care and organization development. In addition, the system contributes to a more result-oriented organization. Keywords: Quality management system, Continuous improvement initiatives, PDCA, LEAN, Traceability of improvement actions, Wide acceptance of employees, Digital tracking system, Toolbox for quality management. Across society, the healthcare sector is facing a critical view of its performance. This includes, in particular, requirements of patients and stakeholders regarding product specifications, results achieved, transparency and manageability of processes [1, 2]. The dynamics and turbulence in society require alertness to the strategic orientation and flexibility of the organization. Hospitals operate in a dynamic environment where interaction with patients, healthcare professionals and availability for new equipment lead to unforeseen challenges and unpredictable events [1, 2]. The strict requirements and regulations for the prevention of risks imply that risk management should be an intrinsic part of the strategy & policy. For accreditation, competence and quality of specific areas of a hospital organization are periodically reviewed on the basis of guidelines and relevant requirements. In this way, uniformity and harmonization are promoted both nationally and internationally. Results of external audits indicate whether the control and structure of the organization are appropriate to generate state-of-the art products and adequate services. The benchmark is high for a hospital organization that continuously improves to perform better. Continuous improvement, based on the Plan-Do-Check-Act cycle of Deming, is needed to assure continuity of the organization. Result-oriented description of projects promotes transparency and completion of various activities within a certain time limit. Central coordination is necessary in order to achieve integrated consistency of activities and coordination . Planning policy combined with a result-oriented approach is a success factor for implementing a quality management system [4, 5]. Integrated performance of processes always refers to the policy of the organization, while the interpretation of results, achieved on key performance indicators, leads to adequate answers to the initially defined targets . Processes and procedures for the clinic are described and clarified on the basis of flow diagrams and are managed in a document management system [6, 7]. A quality manual is the key document in which relevant aspects for structuring the hospital organization are made transparent. The Northwest Clinics (Alkmaar, The Netherlands) is a hospital consisting of two main locations providing high quality care. Care that is effective, efficient and patient-oriented and tailored to the real needs of the patient. The hospital organization is a dynamic and ambitious organization, which however also has to deal with a large number of external factors. External factors include an evergrowing number and rapidly evolving set of legislation and regulations, new guidelines, insights and methods for treatment of the medical professions and external accountability through indicators. In the Northwest Clinics, several documents are used in the regular strategy & policy cycle to promote a result-oriented approach to activities. It also deals with policy reports, management reviews, internal and external audits, quality assurance reports and reports from the incident and complaint management system. Audits and error messages are important tools in the design of continuous improvement processes. Critical analysis of processes and the way in which professionals manage the hospital organization result in signaling points for improvement. Regarding the above, it was concluded that implementation of a smart and transparent quality management system was necessary for employees and stakeholders . For the purpose of realizing structure, coherence and easy accessibility of information about ambitions, results, developments and regulations, the Northwest Clinics implemented an integrated quality management system, called Northwest: How we Work, including the House with Achievement books. For the purpose of being a more result-oriented organization, the Improve 2.0 App was developed with a digital tracking system to register points for improvement. In order to structure the maze of internal and external documents, requirements, guidelines and indicators, the Northwest Clinics developed in 2006 the House with four different integrated levels. Fig. (1) In recent years, the House continuously improved according to the latest insights on quality management. The so-called House and Achievement books contains agreements that are essential for optimal patient care and management. These are the agreements that apply to the Northwest Clinics, e.g. subjects of strategy & policy, measurements that are performed and hospital-wide protocols. The Management Board of the Northwest Clinics is the owner of the House. Supervising the development and maintenance of the House has been delegated to the Quality department. The House provides an overview of what we do in the hospital with the most recent events and developments. (Fig. 1) The roof contains the Mission Statement of the organization (reason for existence).The top floor contains documents concerning Vision (desired state as seen by the main stakeholders), strategy & policy, core business of the Northwest Clinics, indicators and the functioning of advisory boards. Documents concerning business control are stored at the second floor. All health care processes are described at the first floor. The procedures, protocols and instructions also include the responsible persons for carrying out the activity. The Achievement books (ground floor) describes how we do it in the Northwest Clinics. The Achievement books contains facts and figures of each department and discipline including their annual plan and report, core business, organization chart and practical aspects. Each Achievement book has a fixed format, consisting of 7 chapters: leadership, strategy and policy, management of staff, management of resources, materials and service provision, management of processes, ‘test, improve and secure’ and management of documents. The chapter ‘test, improve and secure’ include results on performance indicators such as safety of patients and staff, satisfaction of patients, staff and stakeholders, complaints, audits, improvement actions, ICT security (Fig. 1). Fig. (1). The transformation of a maze with a jumble of documents, guidelines and indicators to a structured House with different integrated levels. In the House is described what we do in the Northwest Clinics. The roof contains the Mission Statement of the organization.The top floor contains documents concerning Vision, strategy & policy and core business. Documents concerning business control are stored at the second floor. All health care processes are described at the first floor. In the Achievement books (ground floor) each discipline and department has described how we do it. The Achievement books, with a fixed format, contain facts and figures of each department and discipline including their annual plan and report, core business, organization chart, practical aspects, results on performance indicators and improvement actions. The green elements are managed top-down; the blue elements bottom-up. In collaboration with the Patient Safety Company (TPSC, Alkmaar, The Netherlands), a tracking App to manage all points for improvement within the Northwest Clinics, called Improve 2.0, was developed in 2014-2015. Improve 2.0 is a software application where all points of improvement can be registered at a central location. Transparency is achieved by dividing the points for improvement to specific owners, source (internal or external, audit, risk management), category (employee, client, stakeholder), department, status (new, in progress, completed, rejected, reopened) and priority (low, medium, high). Proprietors are responsible for execution and completion of a certain point for improvement and describe the intended result, the priority and the intended date of realization. The specific file of a point for improvement comprises action plan, activities, progress and others involved. By using filters, all data in the Improved 2.0 app can be used for management reports and graphs over a certain period allowing improvement actions to be assured. An integrated quality management system, called Northwest: How we Work, including the House with Achievement books and the Improve 2.0 App, were successfully implemented in the Northwest Clinics. An overview of the Northwest: How we Work system is demonstrated in (Fig. 2). 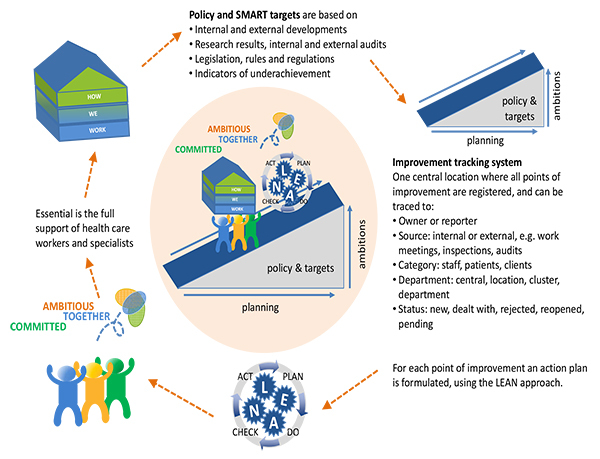 Strategy & policy were formulated based on internal and external developments, investigation results, results of internal and external audits, legislation and guidelines of professions and results on indicators of patient outcome. Ambitions, rules and regulations were translated into hospital-wide commitments and developments. Strategy & policy were translated in annual targets and results using the EFQM excellence model . Results of audits, safety rounds, risk assessments, process improvement and performance indicators were systematically compared with the objectives to be achieved, the expectations of patients, employees and stakeholders and the degree of compliance with the requirements of regulatory bodies and supervisory authorities. Negative trends and deviations were analyzed and lead to actions thereby creating sustainable improvements (Fig. 2). To centralize the jumble of action points on various lists, tables and files in all departments, the digital tracking system for improvement was implemented (Improve 2.0 App). Using a combination of the PDCA approach for continuous improvement and the LEAN approach for process optimization and adding additional value to the business processes through the eyes of patients, staff and stakeholders, action plans were formulated for each point of improvement [7, 9, 10] Fig. (2). With the Improve 2.0 App structure, relations between and coherence of the various improvement activities were realized. Moreover, identical quality improvement actions and possible solution approaches in different departments were shared. In accordance with the focus of the Northwest Clinics to learn from each other, maximum ability to solve problems was achieved. Fig. (2). Overview of the integrated quality management system in the Northwest Clinics (Alkmaar, The Netherlands): How we Work, including the House with Achievement books and the Improve 2.0 App with a digital tracking system to register points for improvement. With an integrated quality management system structure, coherence and easy accessibility of information for staff and employees about ambitions, results, developments and regulations can be realized. Before the introduction of the House and Achievement books, each of the 79 departments of the Northwest Clinics has its own quality manual and multiple action lists. Considering the amount of decentralized quality manuals, management of organization-wide guidelines was difficult and undesirable. Introduction of the House with Achievement books enabled the organization to manage organization-wide guidelines and procedures in a centralized manner. The House with Achievement books avoids duplication of efforts. Using one standardized template, guidelines and procedures are entered once, with the result that, in all departments at the same time, the same information is available. Only department specific guidelines and procedures are added by the departments themselves. Information is unambiguous, organization-wide transparent and easy accessible for management, employees and stakeholders such as accreditation bodies. Since the organization-wide implementation of the Improve 2.0 App (2015), the amount of action points increased from 30 to 120 per month (January – December 2015). Together with the implementation of a LEAN approach for process optimization (2016), the amount of action points increased further to 175 per month in December 2016. In addition, the mean throughput time for completed action points decreased from 250 days in January 2015 to 30 days in December 2016. An important condition for a sustainable quality management system that continuously improves itself is a wide acceptance among employees. Employees need to understand the necessity and usefulness of an integrated quality management system within the complex management of a hospital organization. To achieve this acceptance, employees participate in quality groups in order to contribute to an environment of continuous improvement. Furthermore, the management encourages employees to think about innovative solutions, to exchange knowledge and learn from (almost) errors. For reporting incidents or unintended events, a separate system is implemented, called Safety Incident Reporting, which provides insight into the risks in the care processes. The Safety Incident Reporting system is part of the safety management system of the Northwest Clinics. Analysis of reports focuses in particular on how care can be organized so that certain undesirable situations occur less. To increase awareness and involvement, crew resources management (CRM) was implemented in each department of the Northwest Clinics. During training of teams of different departments involved, the focus is on non-technical skills like mutual communication, decision and leadership. Within the Northwest Clinics, the focus is on continuous quality improvement, for example, by determining whether all processes can be a smarter, faster and leaner every day without losing high standards for patient care and quality. Culture and support are important key factors for successfully sharing knowledge. However, transparency regarding bottlenecks does not occur naturally. Also, implementing improvement activities in a systematic way does not mean jumping to conclusions or solutions. It is essential that employees and medical professionals feel engaged. Managers need to understand that for an effective improvement culture, their role is to involve people in the process, equip them to be able and to feel able to change and improve their processes and the way they work [9, 11]. The House was introduced as an instrument to document all agreements that are essential for optimal patient care and management. Over the past years, The House has proven to be of added value in several ways. The House is used as an instrument to demonstrate what you do and how you do in your department. Since The House is accessible for all employees, everyone has the same information and can act accordingly. Employees, staff and managers use it as a reference tool and all new employees use the House as a start to find their way in the organization. However, the House does not provide the follow up of points of improvement. For this purpose, the Improve 2.0 App has been implemented at all departments of the Northwest Clinics. Experience has told us that employees were excited about the simplicity and usability of the software. For each department, all points of improvement are presented on one single list. With one or two mouse clicks, the entire content and status of a point of improvement are transparent. By filtering, only the relevant topics for a specific meeting can be easily discussed and complemented. The progress in points of improvement and control of operational capacity is assured during regular management evaluations. Resulting commitments are registered in the Achievement books of The House. Trends are identified and settled at the central level of the Management Board. Similarly, trends on each department are included in the yearly management evaluation with the Management Board. In 2016, an external audit was organized for prolongation of the NIAZ/QMentum accreditation in the Northwest Clinics. Auditors were enthusiastic about the level in which the integrated quality management system supported meetings, audits and inspection. They indicated that The House had a clear structure and recognizable design, which was also seen in the year plans and management reviews. The combination of the House and the Improvement 2.0 App ensured that the PDCA cycle is consequently monitored. With the high level of transparency of The House, it was easily proven that the Northwest Clinics complies with legislation, rules and regulations, pursues safe care and works consciously and transparently. It is concluded that an integrated quality management system including a digital tracking system for registering points of improvements meets the criteria for continuous improvement of quality. Patient care improves and information from the organization and each department is easy accessible for management, employees and stakeholders, like accreditation bodies. Information is transparent and departments can learn from each other. Moreover, the whole organization is more result- oriented. Internal and externals audits are performed better as previously identified deviations can be easily and structurally checked on performance and usability. Magee H, Davis L-J, Coulter A. Public views on healthcare performance indicators and patient choice. J R Soc Med 2003; 96(7): 338-42. Groenewoud S, Van Exel NJ, Bobinac A, Berg M, Huijsman R, Stolk EA. What influences patients decisions when choosing a health care provider? Measuring preferences of patients with knee arthrosis, chronic depression, or Alzheimer’s disease, using discrete choice experiments. Health Serv Res 2015; 50(6): 1941-72. Burnett D. A practical guide to accreditation in laboratory medicine. London: ACB Ventures Publications 2002. Muntinga M. Managementmodellen voor strategie en kwaliteit Alphen a/d Rijn: Vakmedianet Management 2009. Asif M, de Bruijn EJ, Douglas A, Fisscher OA. Why quality management programs fail. A strategic and operations management perspective. IJQRM 2009; 26: 778-94. Fisscher OA. Persoonlijke kwaliteit van organisaties. In: Lagemaat D van de, Mos P de Processen in beweging Alphen a/d Rijn. The Netherlands: Wolters Kluwer 2000; pp. 127-48. Vaal K, de , Pijl O, Schijndel B, van , Eds. Quality Management in Prade. Hilverson: The Netherland 2013. EFQM Excellence model. Brussels, Belgium: EFQM, 2013. Morgan J. How EFQM and Lean Six Sigma can work together Excellence in action 2015 (May); 5-12. Mazzocato P, Savage C, Brommels M, Aronsson H, Thor J. Lean thinking in healthcare: a realist review of the literature. Qual Saf Health Care 2010; 19(5): 376-82. Reichling A, Jonker J, Eds. Derde generatie kwaliteitsmanagement. Deventer: Kluwer 2013; pp. 153-7.